We ate at Five Guys for an easy dinner yesterday, and had cereal this morning, so I wanted to make a green smoothie to go with lunch, but didn’t have the ingredients for any of the mixes I usually make, but stumbled upon a nice mix as a result. I used my Pro 300 (aka 7500) , since it’s the blender I’m most comfortable with. The only fresh herb we had in the vegetable drawer was dill, and my wife makes a nice yogurt and dill sauce. That coupled with the half of an apple left over from breakfast and the peanut butter I made yesterday gave me the idea for this. 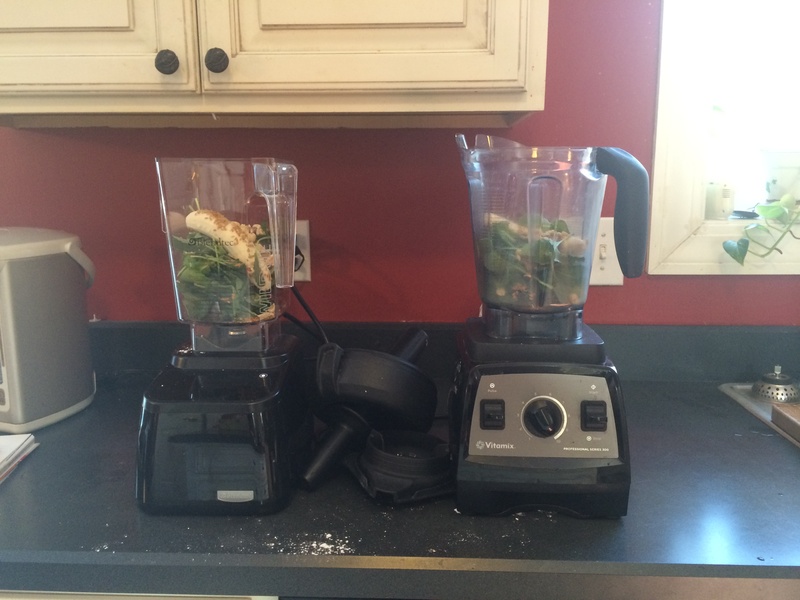 I turned the Vitamix up to speed 5 until it got going, then turned it up to speed 10. I used the tamper on the ingredients for the first 15 or 20 seconds until everything was mixing well. Definitely a good mix, and something I’d be happy to make again with no changes. Find a way to improve on the above mix? Let me know in the comments! 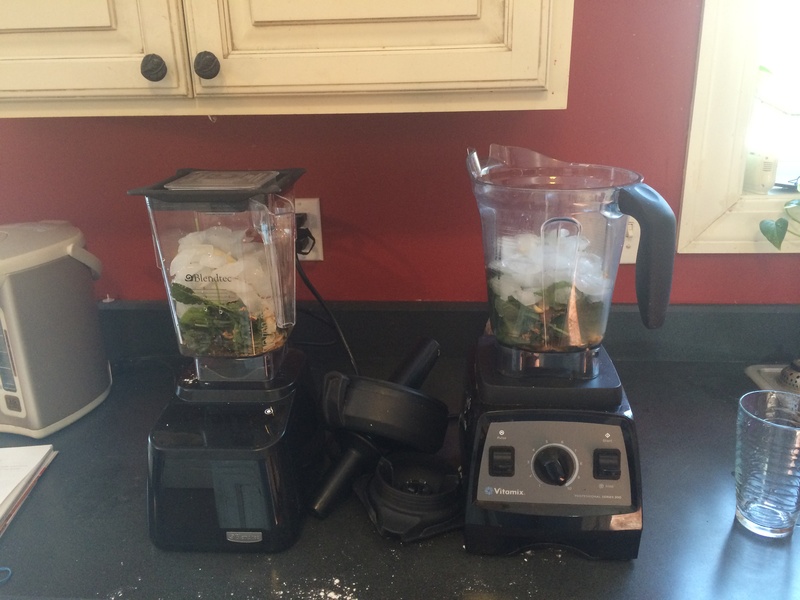 Bachelor Man Green Smoothies (★★★★☆) and I ordered a Vitamix 7500! While they were gone, I used my blender a lot, as my cooking skills are limited when it comes to recipes that don’t involve a blender. I made a frozen mocha drinks, peanut butter, banana milk and the like, but what I made almost every single day was a particular combination of vegetables that I figured I’d share the recipe, as I’m pretty fond of it. I’d blend all that up, and by the end of the five weeks I found myself adding water to start because it made the blending easier, but early on, I’d try to blend it with as little water as possible, bike in to work with a biking water bottle filled with the dense mix and mix it about 1:1 with cold water from the water cooler at work to enjoy throughout the day. Now, the other news is that I actually did go ahead and order a Vitamix 7500 . On a lark, I called up the person at Vitamix that I bought my blender from, and was asking about the 7500. Turns out that she’s actually had a few people mention that they called her because of the post I made in 2011, and she said she’d love for me to share her details again: Brenda Kilbane at Vitamix, 1-800-848-2649, extension 2305, and free shipping code 06-006651. Turns out that if you’re an existing Vitamix 5200 owner, you can trade in your 5200 for $100 off. Now, I’m pretty sure I don’t want to do that, but it’s cool that there is a trade-in option. Another available option was that I can try the 7500 for 30 days and return it without paying anything, which makes trying out the 7500 risk free. Since that’s the case, I decided I’d like to try the Vitamix 7500 and 5200 side-by-side and see how they both perform in different mixes. One of the main things that prompted this is the amount of using the tamper and/or adding water that I was using for the Bachelor Man Green Smoothies above, and I did decide I want to try the 7500 out for myself and see how it might perform. If the 7500 is a better blender, I’ll likely keep the 7500 and give my 5200 to my folks for Christmas. They were crazy about my blender the last time they visited, so I know they’d like it and get a lot of use out of it, and I’d be happy to keep the blender I’m most comfortable with. If the 7500 doesn’t seem like an improvement to me, I’ll probably return the 7500 and keep the 5200. Who knows, maybe I’ll get my parents a refurbished Vitamix 5200 , since it’s substantially cheaper than the 7500. Expect to see some updates in the near future on how the 5200 and the 7500 stack up side by side. If anyone has any specific questions about the 7500, just let me know! Blend everything on high until the Vitamix 5200 heats the milk enough to turn it into hot cocoa. Steam will rise from the top. Drink immediately. You can tweak the cocoa and sugar, but this is the mix I like, and it’s easier to make with larger portions, harder with smaller portions. This is better than I expected, but probably not for most people. Blend everything but the ice cubes, then add ice cubes through the top of the lid while the blender is on high. Hopefully I can post about the Banana Milk variant and other green smoothie later today.